May, 1967. In the six months since the last post, the new Doctor has lost Ben and Polly, but gained Jamie. He’s visited Atlantis, battled Cybermen on the moon, Macra on a distant Earth colony and Chameleons at Gatwick Airport. But all of these dangers fade into insignificance against the biggest threat the show’s ever faced: Terry Nation has decided to try to launch a Dalek TV series in the USA and so this story – though fitting into the normal half-yearly rhythm of Dalek episodes – has been decreed as their Doctor Who swansong. The Evil of the Daleks could not have been more aptly titled. Assessing it soon after The Power of the Daleks, it’s fascinating to see so many of the ideas and themes of the earlier story re-stated and elaborated on. David Whitaker again shows he grasps the Daleks’ mythic nature better than their creator. Whitaker makes them something more than space Nazis: he makes them the source of evil in the cosmos, playing on human weakness for their own ends. In Power, Lesterson, his mind broken, realises with a thrill of horror that the Daleks are pure evil. Here, once again, they have been summoned up like demons by men who are driven by a thirst for knowledge and power, who are prepared to broker a deal with the Devil – and Whitaker explicitly links them with the Devil, with references to “infernal meddling” and “creations of the Devil” – to learn the secrets of alchemy. And if the Daleks are modern-day demons, then their plan entails nothing less than the corruption and damnation of all humankind by spreading the Dalek Factor throughout the entire history of Earth (and note it’s specifically Earth they’re interested in). In their Hartnell stories, the Daleks plan to conquer the universe. Here, at their most terrible, they plan to take over the human soul. Which makes the Doctor’s climactic return to Skaro analogous to a descent into Hell, and the enthroned Dalek Emperor – well, it hardly needs spelling out why he’s the Doctor’s ultimate enemy. The thing is, this absolutely fits with the way the show has been developing during the new Doctor’s tenure. The Hartnell Doctor was an explorer on a scientific mission, and many of the aliens he faced – like the Sensorites, the Menoptra, the Rills, the Aridians and the Monoids – weren’t really monsters. Even the Cybermen of The Tenth Planet had a skewed kind of morality. But the Troughton Doctor, from the outset, has been a crusader against evil, issuing dire warnings to humankind about meddling with the unknown. He believes that there are corners of the universe which have bred terrible things, which must be fought. Here, he can “feel” evil even before he knows the Daleks are involved. Though it’s impossible to believe that Whitaker intended it, the lesson we could take from the way Season Four is panning out is that alien equals bad. And this happens at the same point that the show is focusing more on Earth and humankind. There are at least six Hartnell stories that, aside from companions, don’t feature any human beings. There are only two such Troughton stories (and one of those is a rejected Hartnell-era script), and only one Pertwee story (which is a remake of a Hartnell script). So, when The Evil of the Daleks posits that the Human Factor represents goodness – mercy, friendship, courage – and expressly equates the Daleks with Satan then we’re getting into the kind of simple, dualistic universe of the Hammer Horror movies. The point of all this is not to suggest that the production team of late-1960s Doctor Who is racist, but to show how the series is moving to a place where in two years time the makers can seriously contemplate turning their back on adventures in space and time and repositioning the Doctor as defender of the Earth. The roots of that sea change go back to the transition, in Season Four, from a show about going and exploring the universe to a show about protecting humankind from all manner of cosmic horrors. But while the show’s morality is getting a little less complex, its production is getting more ambitious. The storytelling is a lot more visual with large stretches entirely free of dialogue, and, especially in the middle episodes, relying on the spectacle of Daleks lurking in the shadows of an old house. The move to discrete serials with their own titles has also had an effect – while the producers could have extended The Daleks’ Master Plan ad infinitum by dropping in yet another episode in a strange environment, it’s far harder to hide the joins in the new format. If it’s true that this story was extended from six to seven episodes at short notice, then it’s easy to spot how: the plodding middle episodes focusing on Jamie and Kemal’s quest have been desperately padded out. All of this makes trying to appreciate the story – which is missing six out of seven episodes – very frustrating. Once you get past those padded middle episodes, though, The Evil of the Daleks becomes the iconic story of repute. Because this is far from being business as usual. All the way through, David Whitaker has inserted odd little nods to the very beginning of Doctor Who – like the way a strange man in Victorian clothes whisks two nosey parkers away from present-day London, taking them back in time and then off to Skaro. The final two episodes in the Dalek city are taking the series back full circle in a very modern way, just as the last episode of Star Trek: The Next Generation revisited its first episode, or the tenth Doctor’s final trip took him back to the location of his first. And it works, adding a real sense of raised stakes and resolution to the last episode, a triumph of human good over alien evil. “The final end,” muses the Doctor, as he watches the Daleks burn. In that line it’s hard not to sense the nervousness that must have been going on behind the scenes. 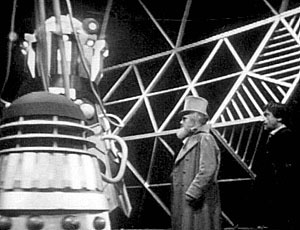 After all, Hartnell was replaceable in a way that the Daleks – the show’s breakout stars – weren’t. It’s not as though they hadn’t tried before, but the Zarbi and the Mechonoids just didn’t cut it. At this stage, the production team seem to be pinning their hopes on the Cybermen, which had been reinvented in The Moonbase three months earlier and already lined up for the next serial. However, recognising that the re-imagined Cybermen didn’t capture the imagination like the Daleks did, the next year – the infamous “monster season” – plays out like a desperate attempt to find a new iconic monster. So we get the Yeti, the Ice Warriors and – last and most definitely least – the Quarks all being positioned as the new Daleks. Which, to be fair, isn’t a bad record even if none of them is more than second rate. The problem is, the producers are on to a loser before they start because with this story in particular, the Daleks have been cemented as the paragon of monsters, the antithesis of humanity. They are everything we define ourselves against. They’re everything the second Doctor defines himself against – which is tragic, given he never gets to face them again. Even if they don’t return for five years, the Daleks’ ghosts haunt the series in The Wheel in Space, The War Games and The Mind of Evil. This story was uniquely repeated in 1968 as part of the continuity of the series. It’s that seminal.